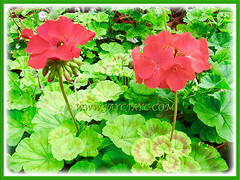 Geraniums are a hot favourite plant for many home gardeners. 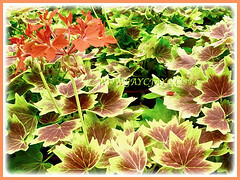 They are so easy to grow and produce various colourful blossoms. Fill your garden with their bright and beautiful flowers to add colour and interest. Truly, Cranesbills will never fail to delight you! Etymology: The genus name Geranium is derived from the Greek word, geranos, meaning crane because the seed pods of the plant resembled a crane’s bill. Origin: Native to southern Africa, Australia, New Zealand and the Middle East. It is widely cultivated worldwide. 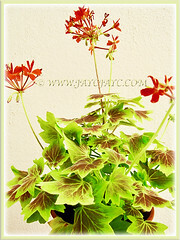 Features: Geranium is popular species belonging to the genus Geranium that consists of about 422 species of flowering plants. They are long-lived plants with most having a mounding habit. The leaves are palmately lobed and held on long stems. The long, palmately cleft leaves are broadly circular in form. Some even have captivating variegated leaves. They produce multi-coloured five-petaled flowers. The flowers have five similar petals. They come in various colours of white, pink, red, purple and many striking bi-colours, often with distinctive veining. Species in the Geranium genus have a distinctive mechanism for seed dispersal. 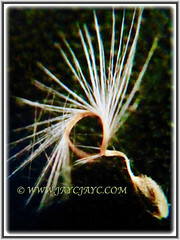 This consists of a beak-like column which springs open when ripeand casts the seeds some distance away. The fruit capsule consists of five cells and each containing one seed. It is joined to a column produced from the centre of the old flower. The common name, Cranesbills comes from the shape of its long narrow fruit that is said to look like the bill of a crane. 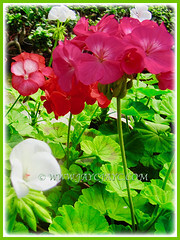 Culture (Care): Geranium or Cranesbill grows easily with least maintenance. Light: Semi-shade to full sun. Moisture: Moderate water requirement. Allow soil to dry between waterings, then water thoroughly. Overwatering may result in a stunted, sickly and spindly plant. Soil: Any soil as long as it is well-drained. Best in humus-enriched and well-draining soils. Others: Regular deadheading will help stimulate additional flowering. 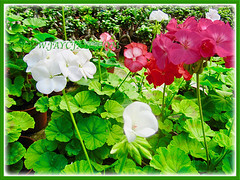 Routine pruning of Geraniums will promote bushiness and avoid legginess. 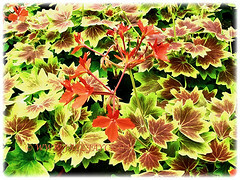 Remove all the withered and brown leaves, including unhealthy stems from the plants to keep them aesthetically pleasing. Feed once fortnightly with a water soluble fertilizer at half strength. Generally free from serious garden pests and diseases. However, they are susceptible to mealybugs, whiteflies, spider mites and botrytis blossom blight. 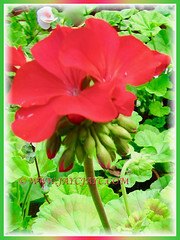 A tender perennial grown as an annual in containers or pots. In northern climates, they can be overwintered inside and set outside again in the spring. The plant needs indoor temperatures of around 18-21° C during the day and 13°C at night. Plants must be protected from cold and wait until the threat of frost has passed before planting outside. With sufficient light, they can bloom indoors all year long. Feed the plants using a water-soluble houseplant fertilizer or a 5-10-5 fertilizer with additional organic matter every four to six weeks throughout their active growing season. Do not feed during winter. To propagate, do it by seed during autumn or by division/cuttings in spring or autumn. Propagation: From semi-ripe cuttings that root easily. Can also be propagated by seed or by division. 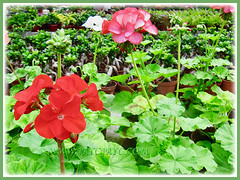 Usage: Geraniums are excellent ornamental plants to be grown outside in the garden or indoors as a houseplant. 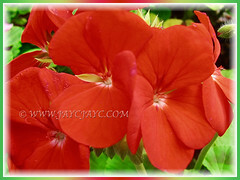 Ideal in hanging baskets and window boxes with their colourful flowers. 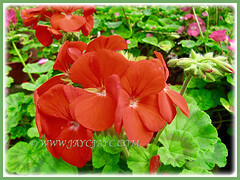 Their bright and beautiful blossoms are suitable for adding colour and interest to the garden. Great for container planting and ground-grown too. Besides being used as a herbal tea, Geranium’s leaves are used in traditional medicine as they are rich in anti-inflammatory properties, relieves chronic pain or migraine, helps to relieve stress and anxiety, aids in digestion and boosts immune system.